With the new Labour-led government's first major set piece announcement only days away, it appears that Labour's leader's office has only just woken up to the demands of government and are poised to significantly upscale the digital communications and research focus in Prime Minister Jacinda Ardern's Labour leader's office. Labour are also recruiting a Senior Researcher and four Researchers. Now Labour have had a pretty solid approach to digital communications while they were in opposition, but the reality of being in government is that there's simply so much more you have to do. What I am finding surprising is that it's taken to the seventh week of the new government for them to start recruiting for these roles. While it's obviously important for Labour to ensure they have the right structure for their leader's office, the lack of staffing has clearly hurt their ability to operate over the past few weeks, as evidenced by their bumbling approach to the House and announcements. As I alluded to in the opening paragraph, the ideal would have been to have these staff in place prior to the mini-Budget. From personal experience, I know how demanding major set pieces can be on the content creators in a team, and having more resourcing in that area opens up big opportunities for the type of content you can produce. When it comes to an announcement like this, which on day 50 of the new government will set the tone for the coming six months, you really do only get one bite at the cherry, and a lack of resourcing will make executing that successfully all the more difficult. Additionally, I've also heard rumour's that on the ministerial office front, Labour has been struggling to attract talent. Apparently they've been offering far below the market rate for ministerial press secretaries and advisors, which is resulting in their offers being turned down. While it's true that you take a pay cut to work at Parliament versus what you can get in the private or broader public service, at the same time the work is hugely demanding and can be personally quite draining, so it surprises me that Labour is getting this so wrong. All that being said and done, I can definitely recommend working at Parliament. No two days are ever the same and, as the saying goes, a week is a long time in politics. Your party can be top of the pops one week, and down in the dumps the next, and all of it usually beyond your ability to control, so it makes for a very exciting ride. The work is immensely satisfying, you'll get to work with some of the most talented and passionate people you'll ever meet, and when things are going well, you do feel like you're making a positive difference for your country. Congratulations, you're an MP in the 52nd Parliament. To help speed you on your way, I thought I'd chuck together a few dos and don'ts based off my experience of using social media and digital channels in a digital context. I've literally written as much as I could think of, but there are undoubtedly things I've missed. Have at the very least a Facebook page and Twitter handle. Facebook is your most important channel for reaching voters. It has upwards of 2-2.4 million active users in New Zealand each month, and with a much more mature content and advertising platform, you're more likely to reach people in your local community. Reliable Twitter numbers are harder to come by, especially when it comes to active users, but Twitter's real strength is the influential people who use it - journalists, business leaders, bloggers, respected tweeters. Other social media channels worth investigating, in order of priority, are: Instagram, Neighbourly, and if you become a Minister, LinkedIn (more on this later). At a bare minimum you should be posting on your main social media channels three or four times a week. A good goal to aim for is at least one post a day on Facebook and maybe two or three tweets per day. When things get especially busy, such as when the House is sitting, or you're out and about in your electorate, you can bump your Facebook posts up to two or three a day, spaced out throughout the day. Use your smartphone to create content on the go. Smartphones are hugely powerful content creation tools. Whether it's taking a quick photo, or recording a short 30 second video, it's easier than ever to create original content for your social media profiles. Facebook in particularly is putting an emphasis on live video. Engage with your audience by asking them questions and answering theirs. As an MP you'll get asked lots, and lots, and lots of questions, and social media has made you more accessible to voters than ever before. An easy way to get people to engage with your content is to ask a question in it, whether it's people's thoughts about an issue in your electorate, or even something like where their favourite local cafe is (not everything has to be deadly serious all the time). Also don't be afraid to answer questions too, even tricky ones and, if you don't have the answer, commit to finding out the answer and get back to them. Get help managing your social media channels. You have Parliamentary support staff, get them to help out managing some of the day-to-day stuff around your social media channels. You're also likely to have some form of centralised support from your party's Leader's office, make use of that too. Share your leader's and party's content. Speaking of Leader's offices and political parties, they're going to put out a lot of easy content for you to share to your audience. Always try to add your own take onto whatever you're sharing too, especially if there's a tangible local angle for your community. For example, if there's new funding announced for new classrooms, and a school in your community is going to get a new classroom as a result of that funding, then make a big deal about it. Find local issues you can champion. You're either an electorate MP or you've based yourself in an electorate. Identify a local issue that's important to your community, and become the champion of it. I can't stress how important this is to giving you runs on the board with the people who are going to vote for you. If you want a really good example of someone who does this constantly, look at National's Chris Bishop. He has picked up issue, after issue, after issue and championed them, even very difficult ones. He's run petitions, public meetings, leaflet drops, met with local and central government, and I think it's played a significant role in him winning Hutt South. I want to assume that you're familiar with the key issues facing your community, but if you're not, your local community newspapers, Facebook groups, and Neighbourly noticeboards are really good places to keep up-to-date with what's pushing people's buttons. If all that fails, get out there and survey your community, whether it's through physical flyer drops, or Facebook advertising, it's a useful way to show your community that you're there to be a leader and champion for them. Facebook has a comprehensive advertising platform and, used well, can deliver very effective bang for your advertising bucks. The problem is, a lot of MPs don't use Facebook advertising well, choosing to advertise meaningless content to their audience, or to audiences that aren't likely to ever want anything to do with them. There's lots of professional advice available to help you make the most of Facebook advertising, and there's a good chance your Leader's office or party will be able to provide some assistance in this regard too. It's not all about page like ads or promoted posts either. There's a lot of more powerful tools available like canvas ads or lead forms that can really benefit you further down the track too. Too often MPs get a website, and create an email newsletter, then let both fall into disuse. Your website should contain links to all your social media profiles, an ability to sign up to, and read previous editions of your email newsletters, as well as contain all your press releases. It's also a good place to keep a visible record of events you've held, or are going to hold. Make use of videos from In the House. In the House (or Parliament TV on Demand) is an amazing service that the New Zealand Parliament provides. And for you, as an MP, it's an easy way for you to source video clips of you in action in the debating chamber. Whether it's your maiden speech, a question you're asking (or answering well! ), or participating in the General Debate, there are plenty of opportunities to use this content to highlight the work you're doing. Be aware that there are rules around using it (Standing Orders Appendix D, Part B). Set up a hidden Facebook page to test content on. The one thing that still gives me nightmares is Facebook live videos. While it's pretty damned amazing that your phone can be turned into a one-person broadcasting solution, it's also very prone to falling over, even if tested thoroughly! If you can, get one of your staff to set up an unpublished Facebook page that you can test things on before they go out in the wild. Whether it's testing a live stream location for mobile data stability and speed, seeing how a designed graphic or post-produced video might appear, it's a good platform just to visually see how your content will look before everyone else sees a terrible mistake. I'll throw in a few more tips before about Facebook Live videos later. Use two-factor authentication where available, as well as anti-virus and malware detection software. And don't open links in unsolicited messages on social media (or email, or any instant messaging tool). You're an MP, there is, unfortunately, a target on your back now for these sorts of things. Facebook and Twitter both offer pretty robust two-factor authentication tools. Read the comments. But don't take them to heart. We so often say "Don't read the comments" on the internet, especially in relation to those on social media posts. But it's a useful thing for you to do, especially if you're going to find questions to answer and help constituents out with their issues. Just don't take any trolling or abuse you see on there to heart. Facebook has a great "Hide" tool that allows you to hide a comment from your page so that only the person who originally posted it, and their immediate friends, can see it, while no one else can. You're an MP, a public figure, and not everyone is going to like you. Politicians are right down the bottom of public rankings of trust, and it takes a very special MP to break that perception. You're going to get people abusing you, asking facetious questions, and generally trying to get under your skin. Don't feel like you need to respond to them or bite at their provocations. I can tell you from personal experience it's never going to end well for you. Focus on talking with genuine people, and if someone is being abusive, you're allowed to block them from engaging on your social media profiles. On Twitter it's also very easy to mute them so you can't see what they're sending you, without them realising you've done so. Get in public spats on Twitter. In a similar vein to not feeding trolls, there's little benefit in getting into public spats with MPs from other parties, journalists, bloggers, or anyone else on Twitter. You can get away with politely correcting a factual error, but leave it at that. You're a Member of Parliament. It might be tempting to try and be edgy, and exploit a point of difference by whacking in the odd swear word, even in an abbreviation, but don't. Really don't. You're not only a leader in the community now, but there's also an implicit mana, respect, and responsibility that goes with your new role. Nothing will undermine your credibility, or ability for people to take you seriously, than if you casually swear. If you've read this far, I'm probably the first person who needs to take this advice. But I'm not an MP, so let's not get distracted by my faults. Content that is short and to the point is generally going to perform best. You might want to record a two minute video explaining an announcement, but you'll be lucky if the vast majority of people will watch more than 20 seconds. Likewise, if your Facebook post triggers the "See more" prompt, people are very unlikely to click it to see what else there is. There's always exceptions to this rule, but you're not Boris Johnson, and you're not Bill English or Jacinda Ardern offering a look at their lives, so let's not go there. The same goes for email newsletters. People don't want 3,000 words on every detail of your week as an MP. They want 300 words and a handful of good photos that cover one or two highlights from your week. Sign up for advertising packages with media companies that include a digital component. As part of your role as an MP, you're going to end up running ads in local newspapers promoting your contact details and, when you do that, there's a chance they're going to try and get you to sign up for them to run social media ads for you too. Don't do this, you'll end up paying upwards of two, three, or even fours times what you would if you ran the ads yourself to reach the same number of people. Your Leader's office, or if you've hired well, your Parliamentary staff, should be able to help you with this. Failing all that, there's always experts like me who are here to help, at a much more cost effective rate. So feel free to get in touch. Post photos form the Koru lounge. Well this isn't entirely written in gospel. If you bump into someone interesting at the airport, feel free to post a photo with them, but don't mention you're in the Koru lounge. Try and do everything yourself. As I mentioned earlier, get help. Whether it's Parliamentary staff, someone from your local party branch, or someone you hire, you don't have to do everything yourself. If you try to do it, you'll find it hugely draining, and it's not always the most productive use of your time. Obviously try and generate as much content as is practical yourself, as first-person, authentic content is much more appealing to your audience than slickly produced professional content. That's not to say that the whiz bang stuff doesn't have its place, but it's best used for big set pieces. Link your Facebook account to post automatically to Twitter, or vice-versa. As I tweeted recently it's nearly 2018, not 2008, and there's no excuse to link your social media accounts to automatically post to each other anymore. Having Facebook post to Twitter ends up with terrible looking URLs in your posts pointing back to Facebook, and in return if your Twitter account posts to your Facebook automatically, Facebook's algorithm isn't inclined to serve content from a rival social network to your Facebook audience. On a similar note, if you're uploading video, try to upload it directly to either Facebook or Twitter, and only link to a YouTube channel as a last resort. Prioritise your social media and digital efforts. It's better to do a couple of social media and digital channels well, then try and do them all and do them poorly. Facebook is a must given its audience size, content tools, and mature advertising platform. Used well it can make a huge difference for you. Likewise channels like Snapchat, which require you to do virtually all of the content creation and posting yourself, aren't necessarily the best use of your time relative to the audiences you can reach elsewhere. As powerful as a Facebook page and Twitter can be, there's other tools. Having a personal profile on Facebook can still be useful, especially if you belong to and participate in the various community groups. You can't participate in these groups as a page, so you have to still have a profile to be involve on them. Likewise, Neighbourly, despite its sometimes clunky interface, can be a very useful tool for participating in your community. The key thing to remember about Facebook community groups and Neighbourly is to not be overly political in them. These are effectively community noticeboards, and people aren't wanting to be overtly politicked to on them. Taking part in these groups is more about the bread and butter parts of being a local MP. Test Facebook Live on a hidden page before you go live for real. And be prepared for it to drop out mid-broadcast even if you have tested it. I've extensively tested 4G connections before, had everything seeming to work perfectly and then, just moments into the Facebook Live broadcast, have everything fall apart. It's part and parcel of working with technology and the reality of trying to do deliver Obama like quality on a Ohakune sized budget. But do try new things like this. The worst that happens is that it doesn't work and you can make a joke at your expense about technological gremlins getting the better of you. It's obviously always a little easier if you can get professionals in to advise and help out. Are you a Minister or are a spokesperson for a portfolio with a significant professional audience? Think about going on LinkedIn. LinkedIn gets a lot of stick for being a bunch of professionals talking about how wonderful they are, and what an influential thought leader they are. And let's be honest, there's a lot of that taking place on LinkedIn, but it's also a good way to directly reach a niche audience that mightn't be as readily visible on other social networks. It's more suited to long-form posts, and as people are posting via their professional personas, you're likely to get a more civilised level of engagement with your content than you might get elsewhere. Play to each social media channel's strengths. Each social media network has certain strengths, so make use of them. Facebook has an amazing ability to reach a huge audience with really sound content tools and a mature advertising platform - use these! Likewise Twitter is good for the here and now stuff. If news is breaking, it breaks first on Twitter, so make use it for that. Instagram is all about beautiful photos (even with the inclusion of video, it's still about photos), so if you have amazing photos, save them to use them on Instagram. Local issues reign supreme in Facebook groups and Neighbourly, so get involved and champion them. Remember, your campaign for re-election in 2020 starts now. You can't just show up six months out from the 2020 election and hope that a flurry of social media activity will shore up your prospects. Even if you're in a safe as houses party stronghold, there's always the risk of someone internally challenging your re-selection if you're not putting in the hard yards to make the most of this incredible opportunity you've been afforded. And finally, if you didn't get the hint from the earlier links, don't be afraid to get professional advice. Your Leader's office might provide some themselves, but you're largely going to be responsible for driving your own online efforts over the coming three years, and as an MP, you already have a massive amount of work ahead of you. My wife suggested I put together a two minute guide on the election. Instead it became five minutes long and examines how the election campaign might look if you saw it through social media. Hope you enjoy! What matters most on Facebook? Is it page likes? Post engagement? Reach? Impressions? It's one of the hottest debate topics in social media, especially in the political field. The truth is that how much each metric matters largely depends on what you're trying to achieve with your Facebook page. 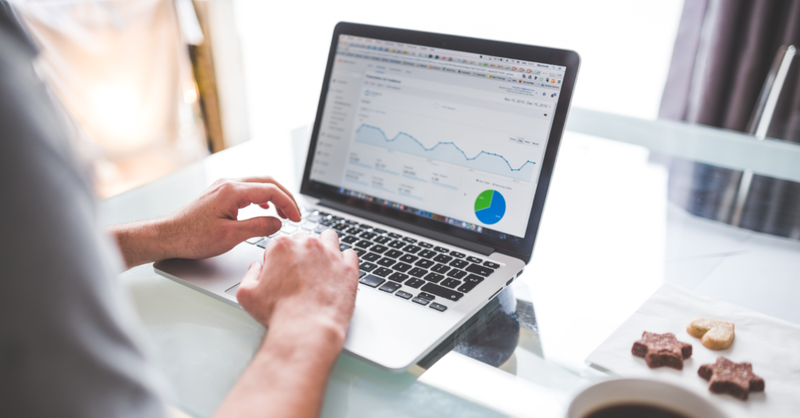 Though it's worth keeping in mind that the publicly visible statistics of page aren't the be-all and end-all of how a page might be performing, but they're a useful starting point. Viral-multiplier: Other than ensuring a decent background level of visibility for your page, a page with more page likes is far more likely to have a piece of content go viral organically thanks to there being more eyeballs on it. Community support: Having more page likes means you have a larger community of supporters who are ready to engage with your content, whether that's reacting, commenting, or sharing it. The largely that community is, the more validation it gives to others who are part of that community. As a rule of thumb I've usually found that page likes usually translate to a page reaching around two to three times that number of unique people each week - and that's without advertising money. So an active page with around 200,000 likes will reach between 400,000 and 600,000 people on a standard week. That's a pretty useful multiplier to get your content out there. And one of the basics of advertising is to get as many eyeballs as possible looking at your ads. Other than understanding how large your potential organic audience could be, the more page likes you have, the more statistically relevant the demographic, geographic, and interests information you can pull from Facebook's analytics tool will be. Having a better understanding of who your core audience is, and then being able to break that down into more targeted information for advertising latter on, is invaluable to putting relevant content in front of people. Which brings us to reach and impressions - essentially two sides of the same coin. It's useful to define both of these as they're often misused by people (usually to inflate their own success). Reach should refer to the number of unique users who have seen a piece of content from your page. Impressions should be the total number of times content has been seen from your page (e.g. often the same person seeing multiple pieces of content, or the same piece of content multiple times). This allows you to divide impressions by reach and understand just how often people are likely to be seeing content from you. Reach and impressions are useful for comparing social media with traditional advertising mediums, say TV spots or newspaper ads as you're able to use similar metrics to judge success. For example, you could run an ad asking for donations simultaneously on social media and in print and TV advertising, and on each channel you could use a slightly different URL. Using that unique URL, as well as knowing how many people were likely to have seen the ad in each channel, you're then able to understand which was the most cost effective in driving donations (hint - it's almost always going to be social). Like TV and newspaper ads though, reach and impressions don't necessarily mean that someone has actually noticed your content. Just as TV and newspaper metrics assume that because someone has seen a show or picked up a newspaper, and thus seen your ad, Facebook, and indeed other social media channels, assume that someone flicking through their newsfeed and seeing your content has actually noticed it. Often it'll be something they've shot straight past while scrolling down their feed without giving it a second thought. If you ever wonder why pages keep experimenting with differing video and graphic dimensions - it's because they're trying to maximise the amount of real estate they take up on your screen while you're browsing. This is where engagement metrics come into play, as you can usually assume that someone engaging with a piece of content - whether it's clicking on a post, reacting to it, commenting, or sharing it, means that they A) Have genuinely seen it, and B) It actually held their attention enough for them to do something with it. While to some extent higher engagement rates do drive your post to have greater reach in Facebook's algorithms (though I've seen pieces of content with fantastic engagement reach tiny audiences relative to page size) at the very least it gives you the ability to understand see what content is attention grabbing enough that people stop and look at it. As I said at the start, these publicly available metrics aren't the full story. Much of what goes on with social media advertising, especially Facebook, isn't visible. The notion of "dark posts" for instance (while the name is a bit melodramatic for me - it's like claiming a newspaper advert put in one local paper, but not another, or an ad put in the sports section but not the news section, is a "dark ad") is one area where a page might look relatively quiet from the general public's view, but in actuality there could be a whole host of activity taking place from paid advertising campaigns that aren't readily apparent. This was largely the case in the United States 2016 election where the day-to-day content you saw posted on the main candidates' pages was only a fraction of their online activity. Even though, for instance, Hillary Clinton may have been posting upwards of six to eight times a day, she would also have dozens, if not hundreds of supporting ad campaigns running in the background with targeted messages for specific voting groups. There's no doubt a similar approach is being used by all the parties in this election, though given our more restrictive election spending rules, much smaller size, and less advanced Facebook advertising tools, we're unlikely to see the same level of sophistication here. In the end, Facebook page likes do matter, but a lack of page likes can be circumvented by spending money on advertising. They're not the only page metric you should pay attention to, but they're an easy top-line indicator of a page's health and potential audience reach. 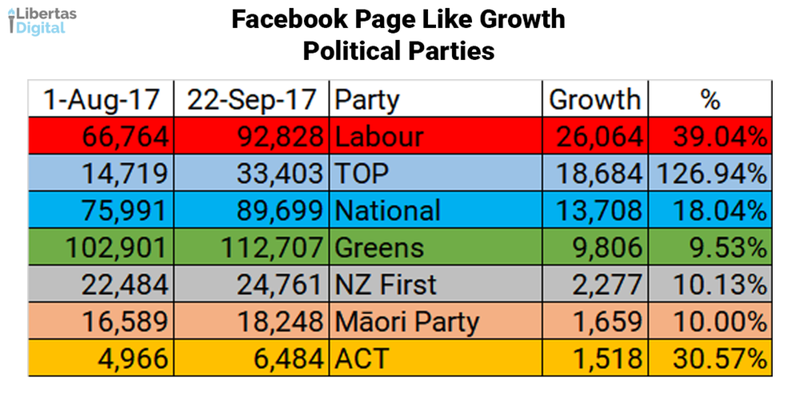 Page likes, and page like growth, are also two of the most popular metrics to appear in media reports on political social media, so it doesn't hurt to have both these figures looking healthy. 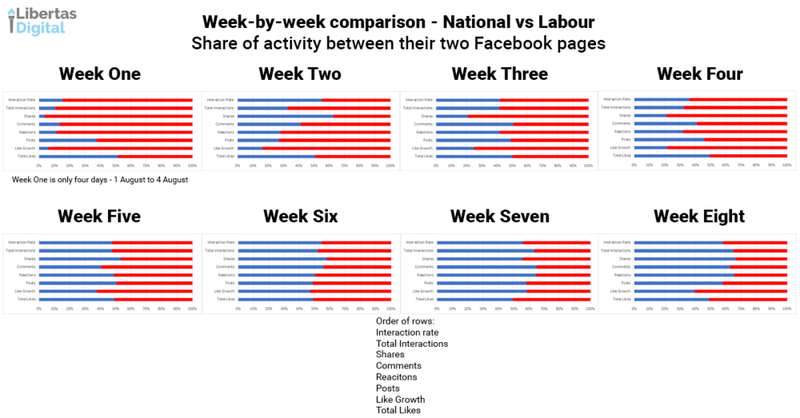 Blogger Patrick Leyland this week wrote a very interesting piece Jacinda Ardern's and the Labour Party's sudden social media rise which, while extremely impressive, does need some context put around it. 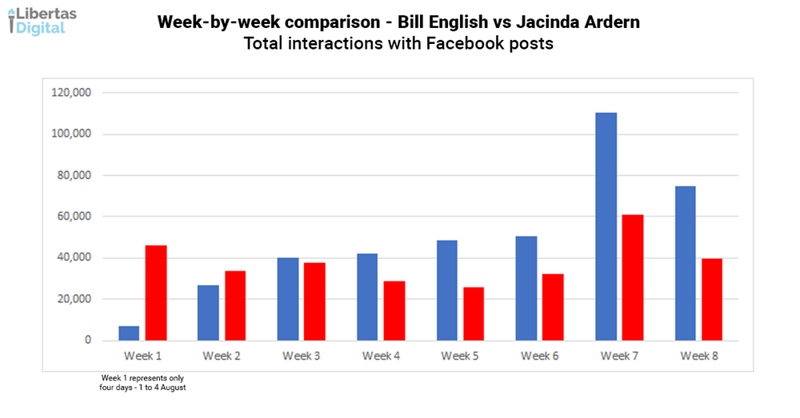 So I thought I'd do a quick bit of analysis myself by comparing her first five days as leader with Bill English's first five days back in December of 2016. It's important to understand this context when comparing the two leaders as it helps provide a much more useful comprehension of what's going on. Looking at the data and thinking about the background of it all, it's made me realise is that Andrew Little's brand wasn't just toxic in terms of his own popularity and ability to reach out to voters, but that he was collectively dragging down the Labour Party and its MPs too. His stepping down has effectively removed that burden from the Labour Party and its seeing the benefits now. Because if there was one thing that did strike me over my three years at Parliament, it was how poorly the Labour Party did online post the 2014 election. Whereas the Greens and Winston Peters both did well - Winston Peters in particular - Labour and Andrew Little seemed to be stuck firmly in neutral. As to whether this first week spike translates into sustained momentum for Jacinda Ardern and the Labour Party remains to be seen. As I wrote back in Brand Bill vs Brand Jacinda, getting the right leader is only half the battle for Labour. Beyond that there are serious structural and personnel issues that they won't be able to address prior to the election, so the extent to which she can reverse the damage that's already been done is difficult to judge. Yesterday I said that Jacinda Ardern becoming leader of the Labour Party could be the circuit breaker the party so badly needs to get its campaign back on track. Now that it's happened, it's time to look at what Jacinda offers that could give her the ability to succeed where Andrew Little failed. I've already covered off how much more popular Jacinda is on social media than Andrew was (essentially twice as popular on Facebook and four times as popular on Twitter), and in the last 24 hours she's already added an extra 4,000 new likes which is a fantastic result. As I mentioned yesterday, this gives her a significant advantage over her predecessor in reaching more people organically without having to spend money on promoting posts. I think what's more important though are the personal brands of both Bill English and Jacinda Ardern and how they contrast to each other. Looking back to 2008, one thing that worked very well for John Key was the contrast between his personal brand of ambition, charisma and confidence, and Helen Clark's brand of stability, experience and stoicism, and this year we're finally seeing a contrast between the two party leaders, something that Andrew Little wasn't able to achieve. The problem for Little was that his personal brand was remarkably similar to Bill English's. Both were effectively competing for the mantle of being a traditional Kiwi bloke, with the primary difference being that English traded on his rural farming background, while Little traded on his urban union background. Unfortunately for Little, John Key had been so good at occupying this position that a significant part of his brand goodwill rubbed off on Bill English, meaning Little's personal brand was trying to compete in a marketplace already dominated by an established player. In many respects, trying to "out bloke" either Key or English was always going to be a losing strategy for Andrew Little. This is where Jacinda Ardern's personal brand comes into play. She's not trying to compete with Bill English on the traditional bloke front, rather she has her own, very successful, personal brand as an ambitious and compassionate urban liberal. Whereas Andrew Little's brand was too close to that of Bill English's, and thus struggled to get noticed, Ardern's personal brand is a stark contrast, and that's going to help it instantly get traction. What struck me is that both leaders' brands share several traits. They're both intelligent, they're both motivated by values that are important to them, they're both ambitious, and these are all attributes that mark them out as leaders. Where they differ, as I've alluded to earlier, is the very publicly visible parts of their brands, it's Bill's experience against Jacinda's youth focus and energy, it's Jacinda's urban liberalism against Bill's rural conservatism, it's Bill's competence and strong work ethic against Jacinda's sublime media skills and fresh face. Jacinda Ardern absolutely offers a circuit breaker for Labour, but it's important to keep in mind that Labour's problems do go much deeper than just the leadership. The party does have fundamental structural issues that have gotten them into this mess. For instance, the leadership primary process that delivered them both David Cunliffe, Andrew Little, and all the subsequent staffing and policy disasters that have followed it. Unfortunately for Labour, seven and a half weeks away from an election isn't enough time to fix those underlying problems. Think by signing your name and email to an online petition that you're showing your support for an issue that's important to you? Think again. While getting you to show your support for something is part of the reason why political parties and lobby groups hit you with an endless stream of petitions and sign up pages, it's no longer the primary driver of this behaviour. Ultimately it's all about getting your email address and starting you on a pathway to being an active support and participant in their campaign or cause. Having already covered the extensive lengths political campaigns go to in persuading you to support them, I'm now going to look at how they aim to - and I apologise for borrowing a corporate term here - move you up their value chain. Voter sees content about an issue > Voter signs up via a petition on that issue > Voter receives request to donate > Voter receives request to join campaign/cause > Voter is asked to volunteer. The idea is that each step in this path represents a greater commitment from the person they're targeting, and to move people along that value chain you need to be able to speak to them in an increasingly more targeted and personal way. Traditionally political campaigns have done this through building voter files, and none do it better than the Democrats and the Republicans in the United States. As I've previously recommended, Sasha Issenberg's The Victory Lab does a fantastic job of explaining how this data driven approach has both evolved and is implemented in the U.S.
Where the U.S. and overseas jurisdictions differ from New Zealand is that their privacy and information sharing laws are much more lax than those here. If, like me, you've signed up to receive emails from both the Republicans and the Democrats, you may have noticed that you also eventually receive other emails from affiliated campaigns and causes. That's because they're constantly buying, selling, and refining their voter files to get the best possible information on voters so they can better identify those they want to target, and what messages that want show them. What's changed in the last decade hasn't necessarily been this approach, it's been the channels it's applied to and the scale on which it can be done. Prior to the internet and social media it was used to micro-target direct mail, newspaper, radio, and TV advertising buying, door knocking, and phone calling. Now the same methodology is being used on social media, email, and online ad platforms, and it's backed up by data on an unprecedented scale. As I mentioned before, New Zealand's privacy laws means that unlike the U.S. where political parties go and buy massive consumer data sets from commercial providers, that's simply not possible here. The net result has been that New Zealand's political parties, lobby groups, and NGOs have to go out and build these data sets themselves largely from scratch. This is why signing your name, age, email address, and town or postcode to a petition is almost mandatory to be able to show your support for it. Because once they have that data, they can add a line to their voter file with your name, contact details, demographic and geographic information, and issue tags to it. The idea then is that they begin to target you through their online channels to get you to take the next step. Signed a petition? How about you donate so you can support us as we fight for it? Donated? Why not join our campaign and be part of a community of like-minded people? Joined our campaign? How about getting out and about and volunteering to help us out? Next, because you've signed a petition on a specific issue, that party, lobby group, or NGO now knows you have a potential interest in that topic, so they can tailor content to serve to you whether it's via sending segmented emails to specific audiences, use it to target Google AdWords or SEO optimise a website, or uploading that email list into Facebook to let it create a broader audience of people who are similar to you via their demographic, geographic, and Facebook activities. On this final note, it's important to keep in mind that Facebook doesn't share that data on who else might look like you with someone who's setting up ads, but it does mean political parties can continually refine their voter files, data analysis, and targeting strategies by serving up similar content to those people. While the Green Party of Aotearoa New Zealand have, in my mind, historically been the best at this, largely borrowing techniques from Greenpeace, WWF, and Forest & Bird, as far as I'm aware the Labour Party have had the single most successful sign up campaign with their "What number baby are you?" My understanding is that Labour gained somewhere in the order of 40,000 to 50,000 new email addresses to it, and while there was a larger than normal level of backlash to it when people realised they were also signing up to Labour's email list, I'd wager that the churn of unsubscribes they were getting were far outweighed by the gains they made. It's also worth pointing out that contrary to the headline in the above article that Labour was tricking people into signing up, from my experience there's usually been text (and I believe it's a legal requirement) to the effect that signing a petition means you're agreeing to receive communications from that political party and its candidates. As someone who's worked in this field, the notion that this is somehow a political dark art I think isn't really fair. Rather, it's part and parcel of the continuing evolution of not just communications practice, but what we're seeing more generally too across society. Other than long-standing commercial use of consumer data to target people with advertising, this approach also has the potential to offer massive benefits from a civic and social perspective too. Whether it's getting people to engage with our democracy at all its levels, being able to understand how to communicate with people in a crisis via targeted alerts across mobile phones, social channels, and physical alerts, or being able to more accurately predict and intervene early to prevent health or law and order issues, data like this can and is used in a responsible and productive way. We're hugely fortunate in New Zealand that we do have very robust structures in place for governing its use responsibly, and a culture that does err on the side of caution about its use. Next time we'll look at how political campaigns aim to Mobilise their supporters to get out and vote for them, a phase of political campaigning that now spans the two weeks prior to polling day with the opening of overseas and advance voting. Last week I introduced the concept of there being three phases of political communications - Persuade, Participate, and Mobilise. Today I'm going to drill down into the first of these - Persuade - which in New Zealand's election cycle makes up the bulk of what you've seen over the past three years. Just the weekend been you will have seen these played out around the country too with hoardings going up around the country from midnight on 22 July. I've listed their priority in these way as in my experience, and supported by some academic insights, these tend to be the factors that sway a voter when they're deciding who they want to vote for. There's a reason why personality politics have become the norm in our highly media saturated world; it's because values and identity are the primary drivers of voter behaviour. 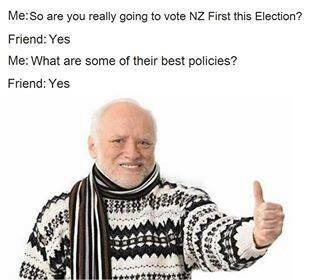 If you look at a politician like Winston Peters, it's doubtful whether his supporters know what NZ First's policies are other than the Super Gold Card. However, they believe that his anti-immigrant and economic nationalist rhetoric aligns with their own values that hark back to a largely imagined "golden era" for New Zealand from their youth. They identify with Winston Peters as someone similar to them, and so vote for him. There's been three pieces of digital content recently that are perfect examples of values and identity communications. The first was the Green Party of Aotearoa New Zealand's Great Greens campaign in April which was all about highlighting the diverse range of values, issues, and lifestyles that Green Party supporters have in common. National followed with their own piece squarely focused at linking Bill English's value and identity with that of Middle New Zealand with Let's Get Together. Labour has been the most recent with their first campaign ad which attempts to soften Andrew Little's often harsh public image by showing him in family and relaxing settings, as well as throwing in a bit of policy and leveraging Jacinda Ardern's popularity for good measure. All of these pieces are about highlighting the values that a party or candidate stands for, and promoting them as being someone that voters can identify with as empathising with them and their concerns. While policy communications do often sadly play second fiddle, they're still important. Think about 2005 when a resurgent Don Brash nearly led National to victory over Helen Clark's Labour. Labour's interest free student loan policy was credited with ensuring a significant youth turn out for them and seeing off that challenge and putting Labour in the box seat for post-election coalition negotiations. The party in government and opposition usually approach policy communications differently over our Parliamentary term. A party in government needs to be constantly promoting the good things it's doing with its time occupying the Treasury benches. Whereas the opposition are creating their own narrative over that period about why those measures aren't working so that come election campaign season, they're ready to announce solutions to a receptive public. Getting policy communications wrong can also undermine your values and identity messaging. Nothing illustrates this better than Theresa May and the Conservative's disastrous u-turn on the dementia tax. In an instant May lost her credibility as a decisive leader which drastically undermined all the values and identity work the Conservatives had done. Where you'll see policy communications really ramp up is from early August through to the start of advance voting as parties announce policies every other day. While the values and identity content will continue in the background, you should notice a switch to promoting the policies they're announcing, especially as they attempt to sell their ideas directly to voters rather than relying on traditional media participants to relay their announcements for them. Despite some holier-than-thou claims out there, attack communications do work to influence who people are going to vote for. That being said, they need to be used carefully and sparingly. In New Zealand we've typically opted for a humour based approach rather than the more outright negative stuff seen overseas. National recently did this using a clip from the AM Show where Paula Bennett made light of the fact that Labour's billboards feature both Andrew Little and Jacinda Ardern. Back in 2014 National's theme was the idea of Labour, the Greens, and the Internet Party rowing in opposite directions in their boat. 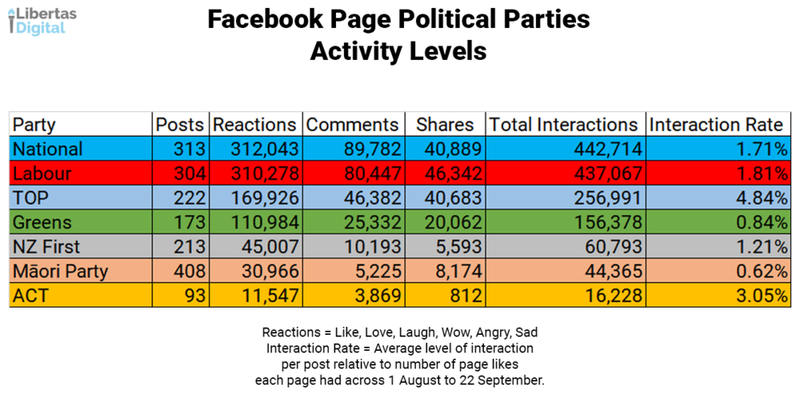 Our left wing parties have taken a more indirect approach, with the Labour Party linked Backing the Kiwi Meme churning out regular meme based attack pieces, as does the Freshly Picked Green Memes, both of which have much largely Facebook audiences than their equivalent right wing pages. Attack doesn't always work though. Again the United Kingdom's election is a good example of this, where the Conservative's relentless attacks on Jeremy Corbyn's links to the I.R.A. and Hamas were to little effect, especially as Labour turned out a massive youth vote for them. The reason why these weren't successful I think is largely due to the fact that the people who this line of attack was most likely to resonate with were already voting Conservative, whereas those aged 18 to 32 largely didn't live through the Troubles in Northern Ireland or Palestinian linked terror attacks, and so they didn't put much stock in them, instead judging the Jeremy Corbyn who was in front of them then and there. An equivalent example in New Zealand has been Labour and the Greens endless use of the neo-liberal attack line, or National and ACT's use of Fortress New Zealand. The negative experiences of Fortress New Zealand and the upheavals that came with liberalising the economy were issues that largely played out through the 1980s and early 1990s. They're upwards of 25 years ago and there's a new generation coming to the polling booths this year who aren't moved by attacks based on conjuring up ghosts of the past. At a fundamental level social media hasn't changed the core themes of Persuade content. All the things that have underpinned political messaging Where it has had an impact is in the ability to reach and target more people so that you can get that messaging in front of a larger audience. When I talked about Middle New Zealand earlier, it's remarkably easier to identify and advertise to that audience on Facebook based off what our most popular interests are. These are usually brands that you'd typically identify as being integral to New Zealand identity. It's things like Whittaker's Chocolates, Air New Zealand, the All Blacks, even imported brands like McDonald's, KFC, and other household names all feature. Keep in mind that this interest targeting is on top of using geographic and demographic targeting too. 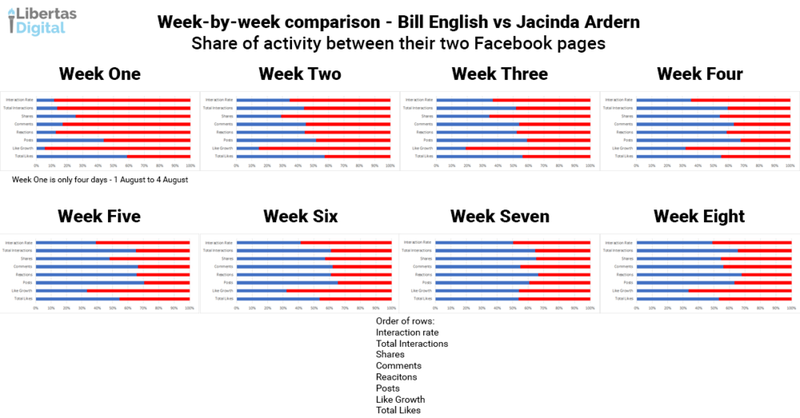 While Facebook's audience targeting in New Zealand isn't as refined as it is overseas, this ability to micro-target audiences on a massive scale at a very cost-effective rate has meant that candidates and parties are able to tell their story and persuade people to vote for them on a much larger scale than could ever be achieved through face-to-face, direct mail, phone calls, or even email. As I alluded to in the Attack section, social media has also transformed the way attack communications are carried out too. The ability for parties and their supporters to create Facebook pages, Twitter handles, or their own websites, is now easier than ever, especially when you think of memes as a form of content. With all the meme generating websites available, this type of content is no longer the preserve of those with graphic design nous and tools, rather anyone with an idea for a meme can turn it into reality in a matter of minutes, and see if it finds legs in the public arena. If it fails, they can always rinse and repeat as often as they like. Thankfully New Zealand hasn't yet seen anything on the scale of professional trolling as detailed in the New York Time's report "The Agency" which reveals the covert operations of Russian state-sponsored trolls. That's not to say that it isn't happening here, rather if it is it's on a small scale and doesn't make an impact on the mainstream discourse as similar events have done in the United States. In fact the NZ Herald's Kirsty Johnston recently did a very insightful piece on the world of New Zealand's alt-right and their plans to influence the election, which included ideas around using social media. In the next blog I'll look at the Participate phase of political messaging, and how campaigns are using social media and digital channels to get donations, grow their membership, and crucially get volunteers to help get their messages out. Would rather donate to charity than spend on political ads? Yeah right! If you're going to say you'd rather donate $1 million to charity than spend it on political advertising you'd think that's a pretty easy thing to stick to, wouldn't you? 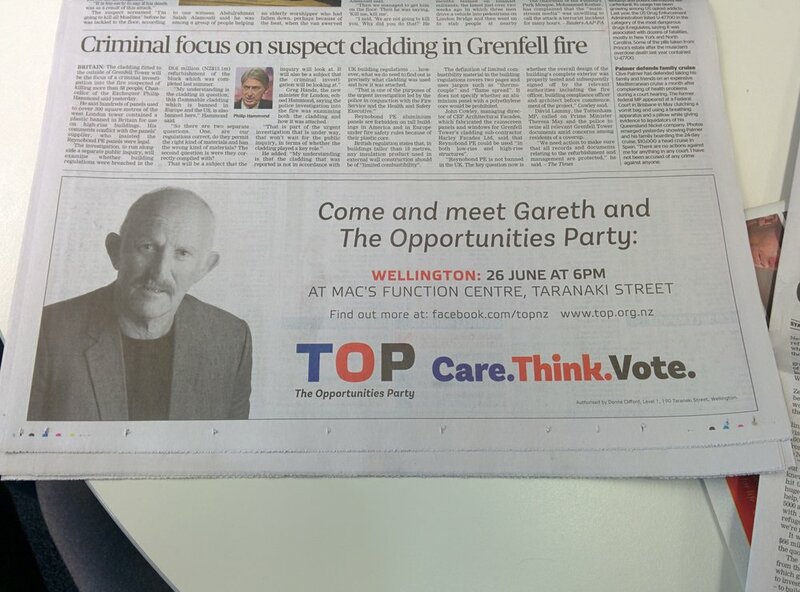 Not for Gareth Morgan's The Opportunities Party (TOP) it seems. TOP got a lot of attention last month for announcing that, in protest over the advertising money allocated to political parties, that it would donate $1 million to charity because they'd rather do that than spend it on political advertising. Rightly, they received a reasonable amount of press coverage for it and while many saw it as a cynical ploy for Gareth Morgan to get himself back in the news, it was at least going to do some good. So far, so good. Except you'd think if you've just announced you'd rather donate to charity rather than pay for political advertising then you'd not run paid advertisements. Seems pretty simple? Except that it's not that simple for TOP. To be fair, you can almost forgive them for spending money on promoting their ads about how they don't want to spend money on ads and donate it to charity. The net effect of it all is that some very worth charities are going to get badly needed funds. The problem is, TOP has now gone on something of a political advertising spree including with print and Facebook ads. The above are all clearly examples of political advertising. The first one teasing the release of TOP's health policy, the next on meeting the leader of TOP, another on their deputy leader on what can be done to bring down grocery prices, and the final one on water policy. They're all examples of paid political advertising. So what happened when I challenged TOP on this blindingly obvious hypocrisy on their part? This is where TOP is really getting disingenuous about their advertising. Being very familiar with Facebook's advertising platform, and given the frequency that I've seen their ads, they're clearly putting a significant amount of funding behind them to get that type of frequency that I've been seeing. So it's not just $100 on a single Facebook promotion, but a very broad and well backed political advertising campaign across a range of content and channels, including that ad in the Dominion Post too. I'd also wager that TOP simply doesn't care about their hypocrisy either. If you've ever witnessed either their leader or deputy leader on Twitter, they both appear, in my opinion, to be rather immune to any criticism or contrary views whatsoever. UPDATE 5 July 2017 3:55pm: Have now been supplied a photo of the billboard. Looks like TOP is treating everyone as fools.